enjoys drives in the countryside where she grew up, partic­ ularly in the Riding Mountain National Park area. Rhona Rogers moved back to Winnipeg in 1994 and is employed with the Royal Bank of Canada. When she is not golfing or curling, she divides her time visiting Erickson and the USA. Ted Rogers married Amy Melby on September 21, 1996. They have one son, Dylan Rogers, born July 21, 1998. After spending several years on the Outer Bank of North Carolina, they moved back to Hagerstown, Maryland, where Ted is in Real Estate and Amy is a teacher. They spend their summers in Ontario at their cottage on Aylen Lake where Ted grew up. 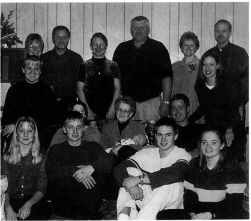 Karen married Gerry Meyer on July 30, 1999, and they reside near Carberry. Karen is employed with the Neepawa Hospital and Gerry farms near Carberry. Karen's daughter, Cathy, was given in marriage by her son, Blake Reimer, to Glenn Buckboro, on July 16, 1999. They reside in Winnipeg. Cathy is employed at St. Boniface Hospital and Glenn works for New Flyer Industries. Cathy's son, Blake, continues his education at Miles MacDonnell Collegiate. They divide their vacation time (camping) between Erickson, visiting Grandma Neilson, and Lac Du Bonnett, visiting with Glenn's family. Daryl Neustater was born in Brandon, MB on June 2, 1958. He grew up west of Brandon, in the Kernnay area, and attended school in Brandon. Daryl finished high school in Brandon and, in 1978, graduated from Lethbridge Community College with a diploma in Renewable Resource Management. In 1979, he went to work as a prospector for Independent Exploration Services from Winnipeg, and then went on to form his own company, Viking Explorations, with partner Curtis Hay (See Wark, Mac and Anna). Daryl spent 9 years staking claims and prospect­ ing throughout northern Canada. He was involved in the discovery of the Cigar Lake uranium deposit, near Waterbury Lake in northern Saskatchewan. This has proved to be the richest uranium deposit in the world. In 1987, Daryl bought some land south ofMinnedosa, MB. He bought a highway tractor and went to work haul­ ing grain and gravel for Moffat Brothers Ltd. ofMinnedosa in the spring to fall season, and continued his exploration work in the winters. Shelley Hyde was born in Erickson, MB on May 18, 1962 and lived on the family farm south of Horod for the first four years of her life. Raised in Brandon, she attended school, graduated, worked at several jobs and pursued a variety of interests. bom. Kelly Lynn was born July 13, 1990. In June 1991, Daryl and Shelley purchased SE 24-18-18 from Julia May Horwood. They built a small bam that they lived in till October. By this time they had finished the wood basement of their house enough to move in. In the summer of 1992 the main floor of the house was completed and they moved upstairs. In the winter of 1993, the Neustater's started a dog sled touring business known as Riding Mountain Sled Dogs, using the 28 Siberian and Alaskan huskies they had bought and raised over the years. The whole family was involved in caring for and rnnning teams of dogs. They enjoyed meeting clients from all over the world who came to experience dog sledding in Canada. In 1999, Daryl started a tree care business called North West Tree Service. By this time, Shelley had been employed by Riding Mountain National Park for 3 years as a gardener. In the summer of 1984 Art and Stella, along with brother, Richard Paulsen, spent three weeks in Norway spending our time with relatives of both Nylens and Paulsens. It was a tremendous thrill to visit the birthplace of our parents, and a memory we treasure. We also had a short trip to Texas to visit Harold and Almie in 1985. In June of 1988, Art passed away in his sleep and is laid to rest in Bethel Cemetery. Stella continues to live in the home on the farm with Jim's only a stone's throwaway and Reg's and Marie's families very close. Stella is so very lucky to have her grandchildren and great grandchild so near and she enjoys all their visits and challenging games of Scrabble and Dominoes.